EA putting its weight behind Battlefield has paid off. Activision has held the crown for best-selling game the last few years with the Modern Warfare 2 and Black Ops entries in the Call of Duty series. Rival publisher Electronic Arts has acted like a younger brother complaining that its games were really good, too! Hey, look at me! Now it seems that whining has finally paid off with EA reporting Battlefield 3 sold five million copies the first week it was available. In fact, EA said that the military shooter is now the fastest-selling game in the publisher's 29-year history, and players enjoyed killing each other on EA's servers this weekend with a 98.9 percent connection rate. Take that, CoD! 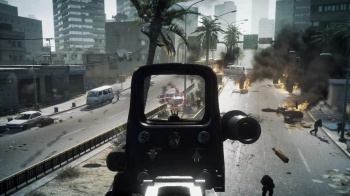 "We are overwhelmed by the global response to Battlefield 3," said Patrick Soderlund from EA. "It is extremely gratifying to deliver an entertainment experience that delights our fans, and to have the opportunity to introduce new people to the franchise. Already, we are seeing unprecedented play times and online activity which is very rewarding. This launch solidifies Battlefield as a leading entertainment brand." EA released some frighteningly violent stats as well: Battlefield players executed 73 million savior kills, 48 million revives and destroyed 67 million vehicles. Perhaps even more terrifying, 2.5 Million Facebook user said they "liked" such wanton destruction. What can men do against such reckless hate? Of course, Activision's Modern Warfare 2 sold 7 million units in one day and total sales topped $1 billion and Black Ops is still printing money. Battlefield might be doing better than EA's attempt at dethroning the king last year with Medal of Honor, but there's still progress to be made. And who knows how ridiculously well Modern Warfare 3 will sell when it comes out next week?